Phase Change creatively re-presents the effects of climate change through an engaging and dynamic spatial construction of melting ice. The ephemeral installation consists of 12,000 pounds of ice harvested from Lake Calhoun (Dakota name “Bde Maka Ska”) in March 2016 and stored passively from March through June. 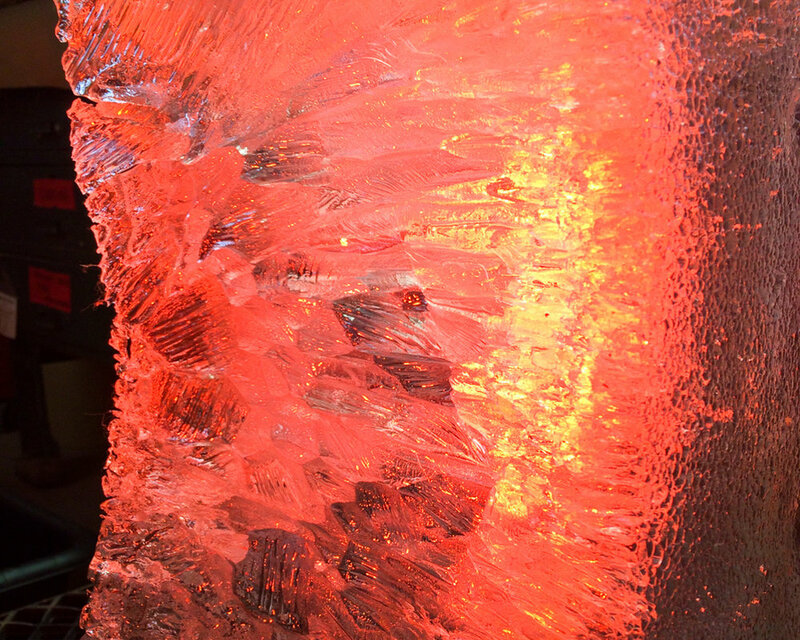 This sculptural ice form faces a lattice of infra-red lamps that are programmed to fluctuate based on data derived from climate change research. The heat produced by the lights corresponds to historical and projected climate change data and melts the sculpture according to three different climate change scenarios: a pre-industrial simulation that depicts climatic conditions as if the industrial era never happened; the present day scenario; and the “worst case” scenario that demonstrates the effects of the most extreme climate change forecasts. Futures North partnered with youth from Youth Environmental Activists of MN (YEA! MN) and educators from Climate Generation: A Will Steger Legacy to guide visitors in conversation about the conditions that threaten to overcome us. Visitors to the installation were invited to observe the ‘phase change’ of ice melting to water and consider what our collective future holds. Phase Change debuted on Saturday, June 11, 2016 at Northern Spark 2016. The installation included the re-constructed ice house, which featured the film piece Polar Forces: universe of an iceberg by artist Ruth Le Gear. The project was presented by Northern Lights.mn and supported by the McKnight Foundation.